Rich-minerals salts from the Dead Sea, the richest sea ever known for its legendary reserves of salts and natural minerals: Sodium, Magnesium, Chloride, Calcium Chloride, Potassium, Brome proven to relieve skin ailments such as arthritis, rheumatism, psoriasis, eczema and acne. These legendary bath salts will relax your muscles, smooth your skin and infuse it with natural essential oils which are vital for the skin’s health and super relaxation. Direction of use: Add a handful of Dead Sea Crystals to a bath full of warm water (about 37 degrees C).Relax in for 15-20min. Then gently rinse your body with warm water. 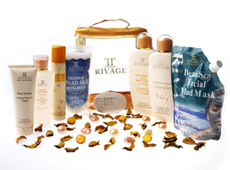 Follow with Rivage Body Lotion.